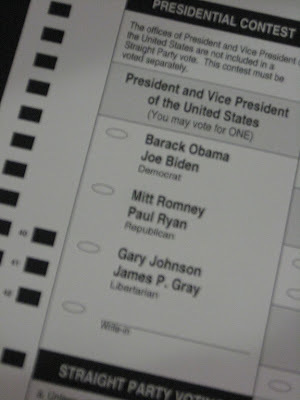 Home » barack obama , elections , florida , mitt romney , politics , president » Somebody voted for me for President! Somebody voted for me for President! 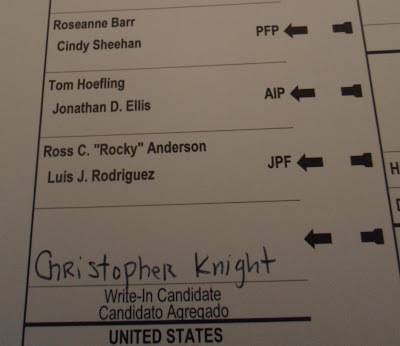 Hey, I got a write-in vote from Florida for the office of President of the United States! 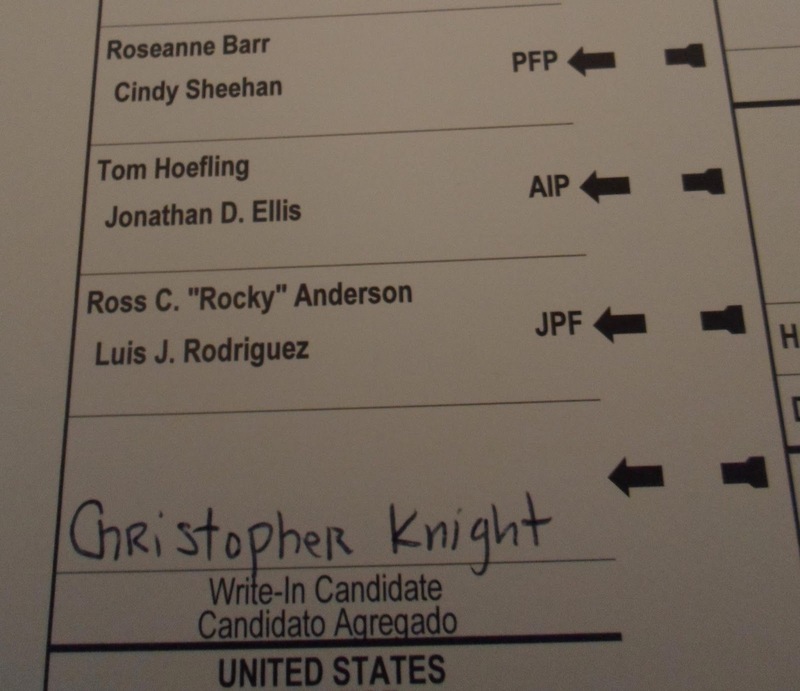 Not a joke: that is a real ballot a friend turned in this afternoon. I doubt I'll win but hey, at least someone thinks I'm more qualified for the job than Roseanne Barr. That's... something, I suppose! There it is. That's it. The space on my ballot for President was left unmarked. Untouched. Unsoiled. As virgin as the wind-driven snow. I had thought of writing in "Rufus T. Firefly". Until a wise friend convinced me today that a write-in vote for a fictitious character or anything like that would have been just as waste of a vote as those who blindly vote straight-ticket. That a much more morally powerful vote would be to choose not to participate in that particular madness at all. Wanna know what most led me to not vote for anyone at all? I believe in the sanctity and preciousness of human life. I believe that nothing has done more irreparable damage to our value of the soul than abortion. It is as Mother Teresa of Calcutta said: "The greatest destroyer of peace is abortion... And if we accept that a mother can kill even her own child, how can we tell other people not to kill one another?" and "Any country that accepts abortion, is not teaching its people to love, but to use any violence to get what it wants." I cannot vote for Barack Obama because of his steadfast belief that innocent human life can be destroyed out of "choice". Nor could I vote for Mitt Romney because he has gone on record many, MANY times as likewise believing that abortion should be upheld and even protected. Enough times in fact that I can not and do not trust his very convenient "conversion" on the issue prior to running for President. "Pro-life" George W. Bush had a "pro-life" Congress to work with... and they did NOTHING about abortion but token gestures! I brook no doubt that Romney will/would be doing just as much. And I am not entirely comfortable with Gary Johnson's position on the matter either. So this afternoon, since were no candidates who I could feel confident enough about trusting my vote with, voted for no one for President. My hands are clean and tonight my conscience is absolutely clear. It can not be said that I "wasted" my vote. And neither can it be said that I lent my consent toward this country's being apparently hellbent toward colossal ruin. Too bad Virgil Goode wasn't on your ballot!